Achieve your full potential and consider in-stock adult cross country singlets that are designed for maximum comfort and support. Check out the line of uniforms from Shop4teams that are specifically designed to boost your speed and endurance. We have built one of the largest online catalogs of cross country uniforms around so you can find all the tools you need to conquer any course you come across. Better cross country jerseys can help you perform at a higher level. Custom cross country jerseys will even make you look better while you’re at it. Team up with Shop4teams to design a custom cross country uniform that will get your runners noticed and feared. We carry all the sizes you need, and all the color combinations you want. 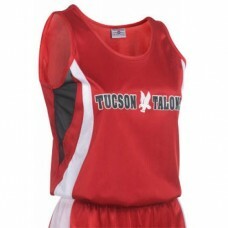 By carrying the top lines in cross country uniforms at the best prices there is no need to look anywhere else. Shop4teams can assist you in selecting running uniforms, team shirts, team warm-ups, and other quality apparel for your running club or cross country team. Loose fit, compression, distance, or speed...Shop4teams can meet your cross country uniform need!